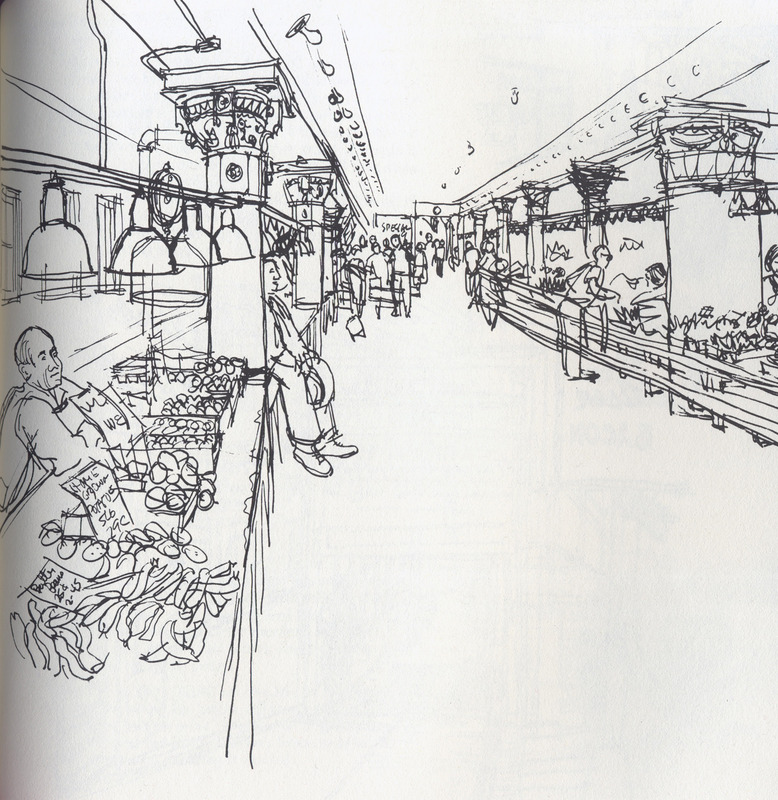 Without Seattle architect Victor Steinbrueck’s crusade to save the Pike Place Market from development in the 1960s, it’s very likely that this blog and the crafts businesses behind it would not exist today. That might seem like an amazing statement given the prominence the Market enjoys today in Seattle’s civic life and the number of visitors the Market now hosts every year but I can assure you that it’s true. It was not Mr. Steinbrueck alone who swooped in to save the venerable market from the bulldozers, but efforts of many people in the Friends of the Market organization that he headed. 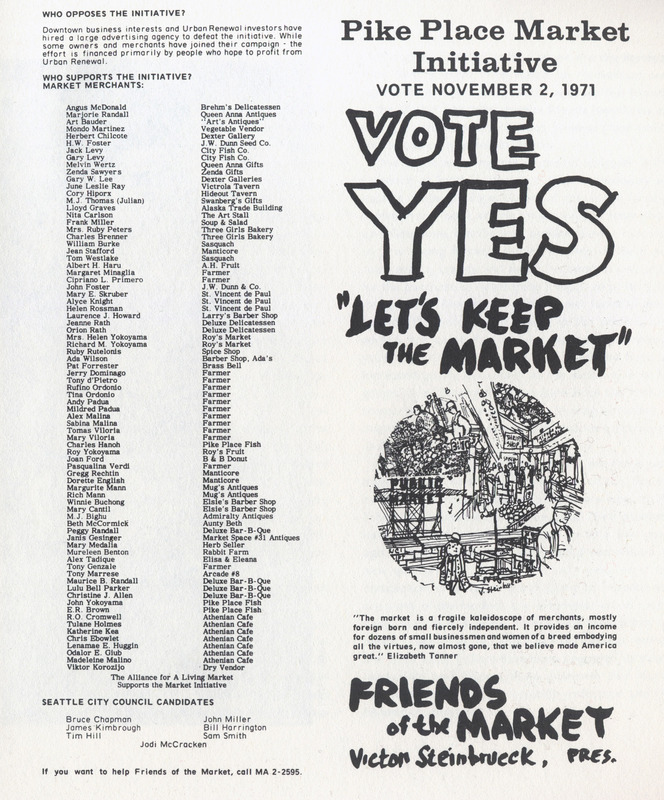 And it was publications like Steinbrueck’s 1968 Market Sketchbook that reminded Seattle residents how much they stood to lose if the Market went the way of so many venerable outdoor public markets at that time in US history. In those days, the crafts community as we know it did not exist. The North Arcade was full of small farmers and the Desimone Bridge was a literal footbridge conveying shoppers across western to the waterfront. In 1971, according to the book’s introduction, anyone could rent a daystall for $2 (a far cry from today’s rents, I can assure you.) Screening in your work through a tough jurying process to ensure quality, variety and their truly handmade, local nature was unheard of. A scant few vendors from those days remain on the craftsline, grandfathered in to sell mass manufactured goods and imports. 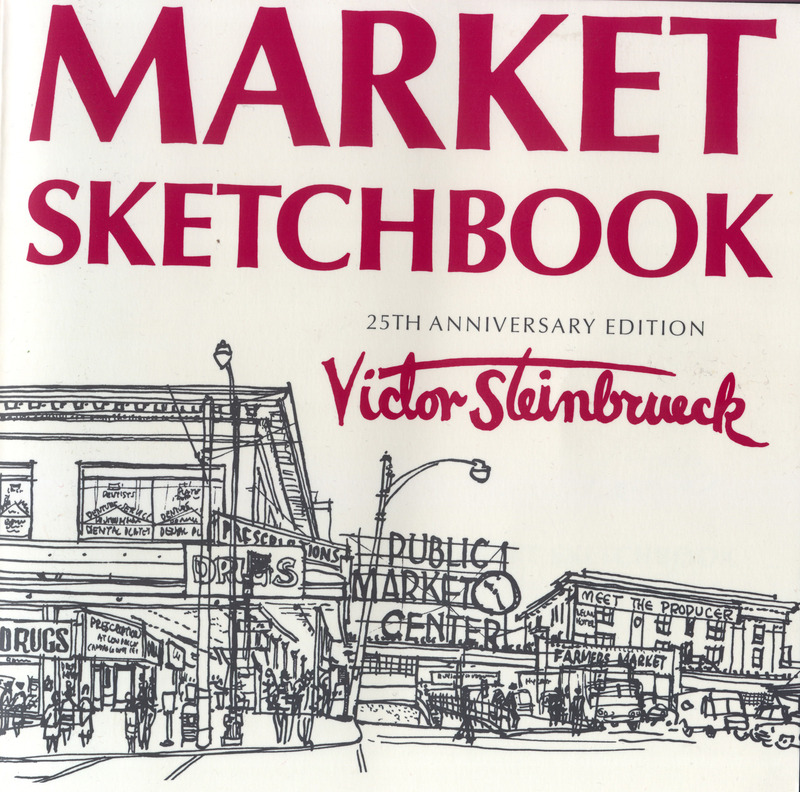 One of my favorite quotations included in the 25th Anniversary Edition of the Market Sketchbook is from Elizabeth Tanner, then Executive Secretary of Friends of the Market: “The market is a fragile kaleidoscope of merchants, mostly foreign born and fiercely independent. It provides an income for dozens of small businessmen and women of a breed embodying all the virtues, now almost gone, that we believe made America great. They survive because the atmosphere in which they live and work here is compatible with their way of life. They can survive in no other atmosphere. The market as it stands today is for all people. There is no discrimination…Can we not save a corner of our city as a place for human contact? Will this not help us to have a more unique and wonderful city?” Though the mix of people who visit the Market has changed over the years to include increasing numbers of out-of-town visitors and tourists and the Market’s vending community has expanded to add craftspeople to its roster of farmers and secondhand dealers (to its betterment, I believe) much of that quote still holds very true to this day. Today, when any kind of development or building is considered at the Market, a large group of community members come together to discuss the plans from the Historical Commission, the Pike Development Authority, the Market tenants from “stores with doors” to daystall permit holders to buskers and regular Seattle citizens who care about this jewel in the middle of their city. 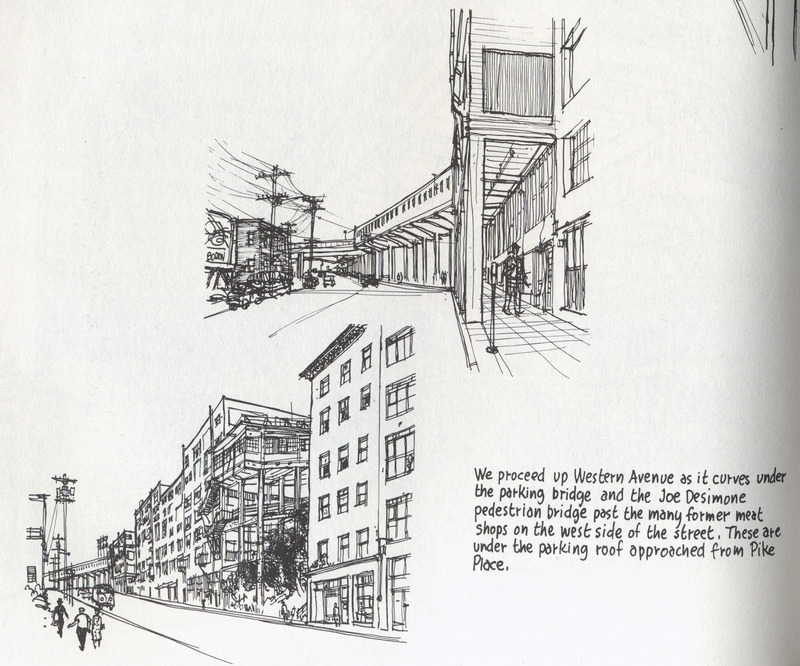 For example, right now plans are underway to develop an underused uncovered parking lot on Western Avenue after the Viaduct is torn down in the next few years. The whole Pike Place community has been extremely active in voicing their needs and opinions about the building’s planned size, use and likelihood of view obstruction. Careful considerations are being made to ensure that the historical character of the Market remains, if not unchanged, at least bettered for the largest number of constituents. Evolution is being embraced with an eye to preserving the treasures of the past and people like the late Victor Steinbrueck have set the tone for this spirit of care and cooperation in ensuring the Market’s vibrant future. 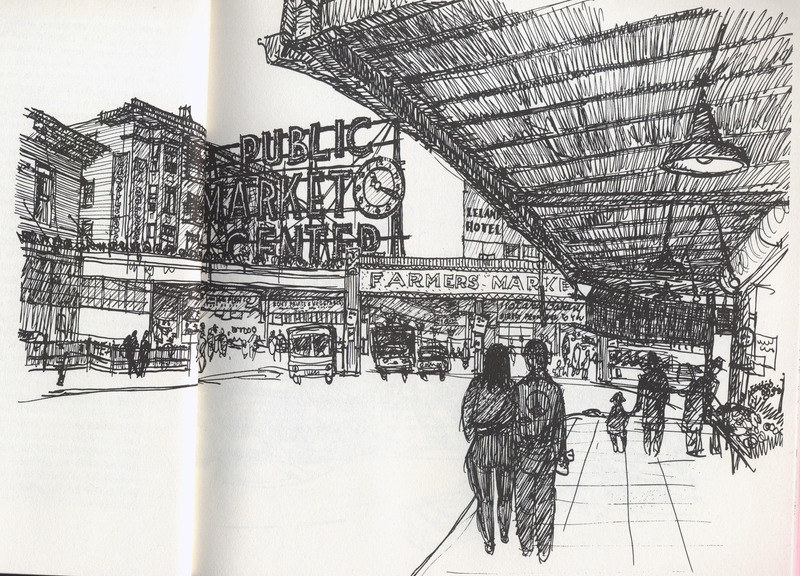 Copies of the Market Sketchbook can be found in almost any Seattle bookshop or, if you’re stopping by the Market to compare views then and views now, you can pick up a copy (and a nice cup of espresso) at the Station No. 1 near the Gum Wall by the Ghost Tours entrance.